Instead of using all coconut milk, you’ll use coconut cream AND coconut milk, for a higher fat content, similar to what full-fat dairy would be. 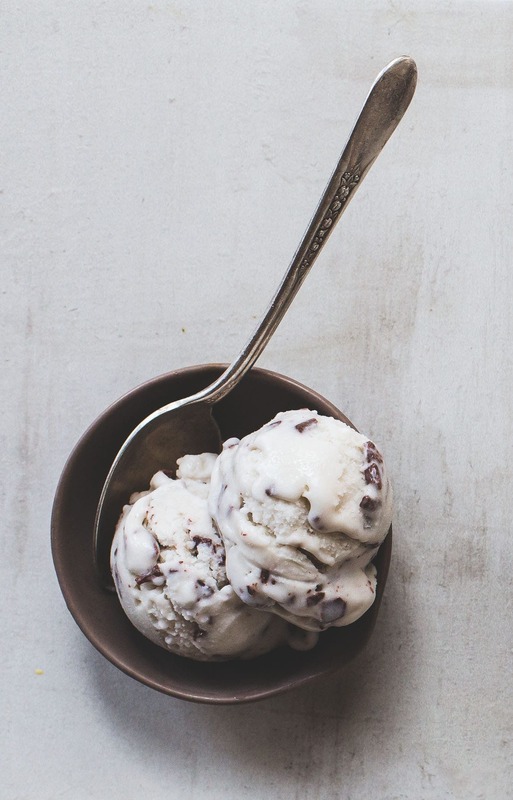 Using a liquid sweetener (maple syrup) and a tablespoon of vodka (optional) helps keep the ice cream scoop-able and soft, which has to do with reducing the chance of ice crystals developing. A slurry of tapioca starch + coconut milk helps thicken and stabilize the liquids, similar to what eggs do in regular ice cream. With a really good bar of dark chocolate hand, I decided to go the way of Vegan Chocolate Chip Coconut Milk Ice Cream this time. 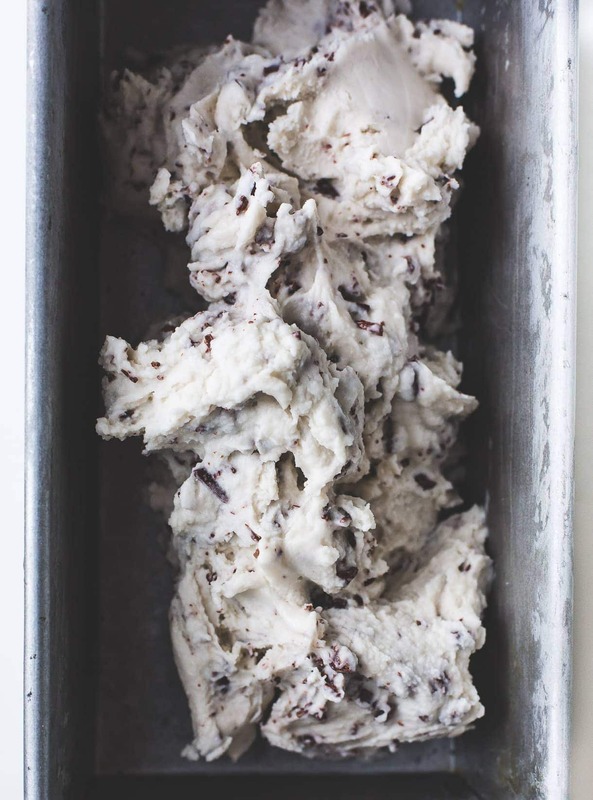 But it’s actually chocolate shards that I finely chopped, similar to stracciatella (italian for “rags or shards”), because chunky chocolate chips freeze hard as a rock in ice cream. No bueno. 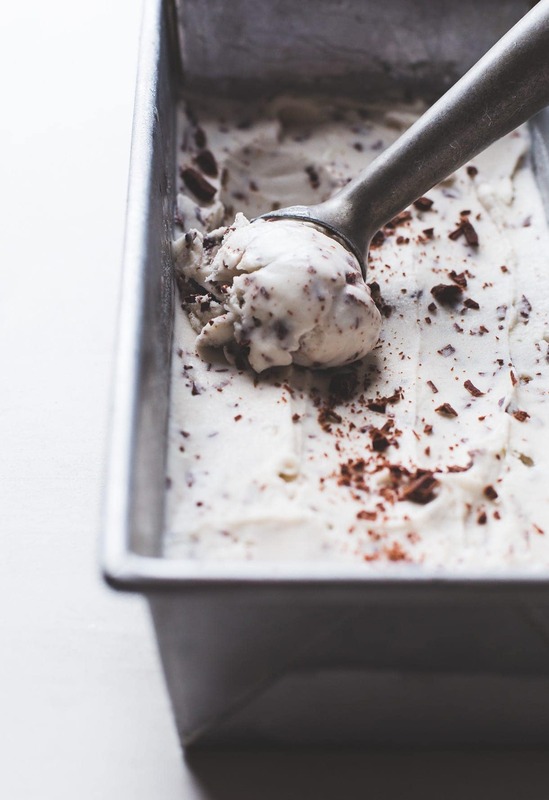 Instead, the delicate flakes fuse with the ice cream and literally melt in your mouth. So velvety and lush, holding a richness I can only compare to custard. And it scoops like a dream, not one bit icy even after being re-froze several times while taking photos. 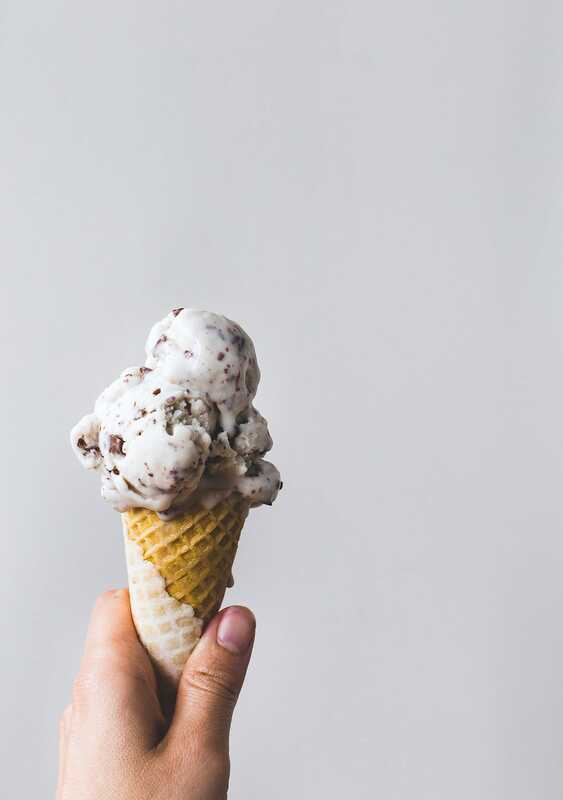 Whether you’re an omnivore, vegan, or different every day (like me :), I hope your summer sees a cone stacked high with this chocolate chip delight. These are my favorite gluten-free sugar cones! Add coconut cream and ¾ can of coconut milk to saucepan. Mix 1 tablespoon tapioca starch with the remaining ¼ cup coconut milk, right in the can, to dissolve. Set aside. Bring liquid to a boil, and add maple syrup, salt, then tapioca starch mixture. Turn heat down to simmer, and cook for 8-9 minutes, until mixture is thick enough to coat the back of spoon. Remove from heat and stir in vanilla and vodka. Let cool for 10 minutes, then add to a ziploc bag and submerge bag in an ice bath. Refrigerate for at least 4 hours, up to overnight. Pour cold mixture into ice cream maker and begin to process. When nearly finished churning and ice cream is consistency of soft serve, add in chopped chocolate, just to mix throughout. Then pour into pan and freeze for 4 hours, until ready to eat. Let sit for 5 minutes before scooping. This blog is supported by Amazon affiliate links. I may make a small commission should you purchase something through them. You are SO good!!! I am loving those dark chocolate shards in that coconut base. Brilliant! i’m an ice cream lover through and through – all year round! but especially summer. :) and yes, a few explanations into the why is always so interesting to me too! Congrats on the video, gf!!!! I really want to try this out. 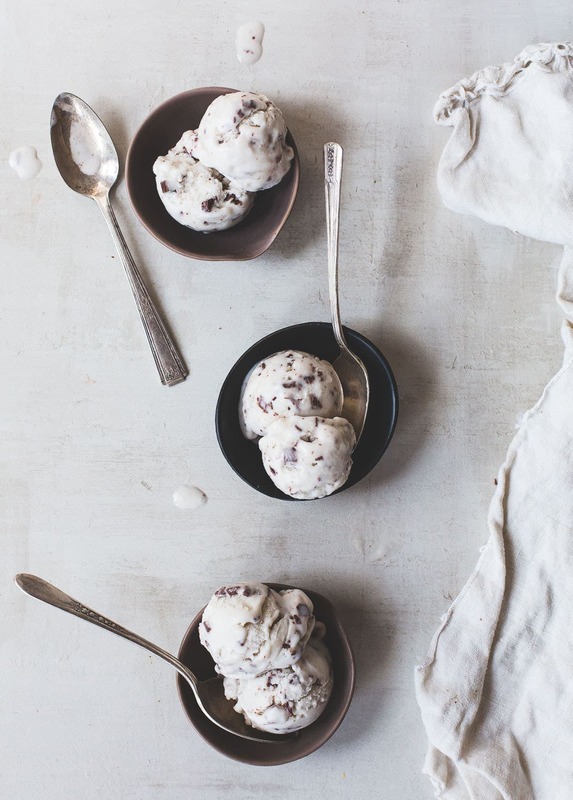 Your method for the dairy free ice cream sounds totally legit. The ice cream looks just like what would come straight out of an Italian gelato creamery! I can’t believe it’s vegan too! Coconut lends the best texture, doesn’t it? I just want to dig in! Hi Emily! Ugh, yes, I get so frustrated trying to find things that seem to be real, but then have unnecessary added ingredients – like coconut milk. I can find the one I listed at Whole Foods now, which is awesome! Delicious recipe, Amanda! And Yaaaas! to adding invert sugar (maple syrup is favored) and alcohol – just a bit will do! Both work magic on reducing those pesky ice crystals. Your video is just fantastic, captured beautifully! I used your previous recipe for the salty honey ice cream and your base recipe is the best. I’d like to use your base to make a mint choc chip ice cream using avocado. I’m wondering if I should eliminate the coconut cream since avocado has fat and also wondering at what point I should add the avocado. Not sure what it would do if I put it in the pan to boil. Thoughts? Love the video & as a novice I want to try but I do not own an ice cream machine. Could I just freeze it in a loaf pan??? Unfortunately I wouldn’t recommend making it without an ice cream. It needs the air whipped into it in order to stay soft and scoopable. But if you do try it, let me know. I made this tonight a day my husband couldn’t stop eating it…..and neither could I..is it still healthy if you eat the whole thing in one sitting? so glad you and your husband liked the recipe Connie! 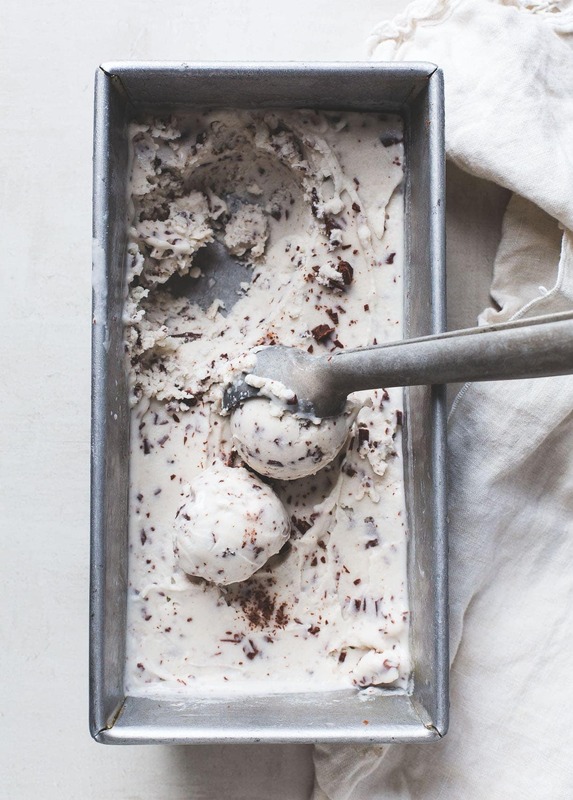 the texture of this vegan ice cream looks really dreamy! I will have to try vodka next time I make ice cream!